MEASUREMENT:pendant measures around 43mm(1.69″) in diameter. 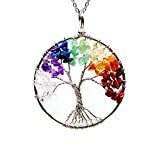 1.Very beautiful and delicate handcraft chakra stone life tree necklace.Will make a stand out piece for your outfits. 2.7 chakra stone pendant will make you feel balanced. 3.Necklace arrive in one cute velvet pouch bag. Ready for gift giving.